This post follows up on my previous note about Alfred North Whitehead’s time spent in Greensboro, Vermont. It was updated on July 7, 2016, thanks to information obtained from the Mitchells’ descendants. 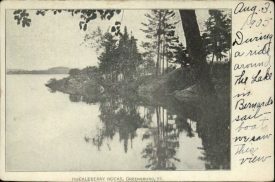 The picture above is of the Huckleberry Rocks in the early 1900s. Below are the rocks today, with the cottage, known as the “Green House,” visible in the distance. “For several summers, the Alfred North Whiteheads and their daughter, Jessie, used the cottage, joining in picnics and toasts on Huckleberry Rocks and the charades the family played in the evenings” (Antler, Lucy Sprague Mitchell: The Making of a Modern Woman, Yale U.P., 1987, p. 274-5). The spryly “entomologist” would have been in his late 60s at the time. What this tells us is that Process and Reality took between two and three years to write, though it was much longer in its conceptual development. As Whitehead seemed to do a lot of writing in the summers, it’s fair to say, following Lowe, that the book was “shaped” in Greensboro during the summers of 1927-29. At least half of it was likely written there, if not more. For a town of 700 (though the population rises substantially in summertime), the northeast Vermont town of Greensboro can now add one more thing to its boasts. In addition to being the longtime summer residence of Wallace Stegner and the focus of his novels Second Growth and Crossing to Safety; the final resting place of ecotheologian Thomas Berry, who was buried there at the “ecozoic” Green Mountain Monastery; and the home of award winning brewery Hill Farmstead (currently the “Best Brewery in the World” according to RateBeer), cheese maker Jasper Hill (makers of the 2014 “World’s Best Unpasteurized Cheese”), the youth circus outfit Circus Smirkus, the Greensboro Arts Alliance and Residency, and with the neighboring town of Hardwick the center of northeast Vermont’s lauded new agriculture scene; it is now also the place where Alfred North Whitehead wrote what is possibly the most important work of metaphysical philosophy of the twentieth century. The Huckleberry Rocks as seen from the Highland Lodge beach on the northeast side of Caspian Lake. 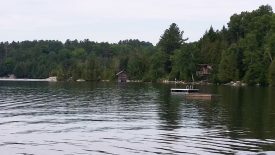 The green cottage is hidden by trees to the right of the boathouse visible in the center-right of the photograph. Thanks to Maureen and Siobhan Mitchell for sharing information about the cottage, and to the Greenboro Historical Society and historian Allen Davis for helping me in my sleuthing for the site. The second photo above is taken from the Mitchells’ rental website for the property. lovely puts him in the same camp (pardon the pun) as folks like Thoreau, can’t help but wonder what he would have made of all the later possibilities of fractals. reading Coupland’s M. McLuhan book and didn’t know he was so taken with Whitehead.